When starting a new game, every player need time to learn the game’s functions and feature. Players of Onmyoji are no different. In hopes of helping new Onmyoji players learn the game faster, below is an entry level guide that I put together. This guide talks about some basic functions of the game that I think is invaluable to new players. When the players get through the opening animation of Onmyoji, the first screen should the above screen. The first thing to do is to choose a server to join, which the players can do by clicking on the red circled area in the above picture. The recommended server is the first one on the right most column (circled red in the picture above). This is the overseas server, which should be the fastest for players outside Asia. Next, the players are ready to enter the game by clicking on the red circled area above. The game would ask the players to create an account name with a maximum of 8 characters. Once the players created the account, the game should begin with a tutorial. Once that ends, the players should regain control and ready to start the game in the court yard of Abe no Seimei’s mansion. Note that existing accounts, the above screen will show up as the player enters the game each time. Simply click anywhere on the screen to start the game. On the top left corner is player info: avatar, user name, level, and experience bar. When you click on the avatar, the setting window will show and you can edit your nickname here. The first circle is the support center and the second circle is to attach your cellphone to the game account. Neither of these two functions work for oversea players because language barrier and no access to phone numbers registered in China. The left side is for you to turn on/off: music, sound effect, auto play conversation. On right side, you can select graphics quality on the first row: smooth or detailed. The second roll is voice and subtitle or subtitle only. You can check the box right below to record screen. The bottom button is authorizing push notification upon energy full and cards used up. Top right roll is for resources showing coins, jade, and energy. The two icon on the top right are mail box and chat . The players’ mails would be kept in the inbox for 7 days, after which they will be deleted. Check often for rewards given. There are 5 channels for the chat room: System、World、Yin Yan Ryo、Nearby、and Team. The chatrooms are irrelevant to English players as they are all Chinese. The scroll in the bottom of the Court Yard is a menu that has eight icons that access different aspects of the game. From left to right, they are: Index, Team, Ying Yang Ryo (Guild), Shop, Mission, Friends, Onmyodo, and Shikigami. This is the first icon on the bottom scroll. In here, there are three indices: Shikigami Index, Soul Index, and Region Completion. This index is for players to look up background information on all Shikigamis collected and listen to voice acting. This index is for players to look up background information on all Otama collected. Players can get rewards from here when all Shikigamis in a region is collected. This is the second icon on the Scroll Menu. The player can search for all the teams that are open to join for a particular battle. Once you click on one of the trial missions on the left menu, you can choose to join any teams with open spots. On the bottom right corne, there are two buttons: Refresh, and create a team. This button is to access Guild page in Onmyoji. Players without a guild can choose a guild to join or create their own guild. Players who joined a guild can access their guild here. On the right side of the screen, there are three tabs: Info, Wish, Rank, and Shrine. The Info tab shows information on the members of the guild. The Wish tab acts as a gift function. Players can request (or “wish”) for the Shikigami shards that they need, or give shards to other guild members/friends. Rank just shows current guild ranks in the server. Shrine is for the guild masters to buy buffs for the Guild. All guild members to actively do Guild Raids to earn points for buffs. On the bottom right corner, the red gate button is the “Realm” and it’s where the players can put their Shikigamis to help guild members and earn experience. The button beside it is the Map and the players can search nearby players and nearby guilds. In every four hours, the players can click nearby guilds to gain 10 EN and to fight the King of Ghosts trial. There are different items for sale in the shop. I will update those as it updates. Notable items are EN refill, exp buff, etc. One item that I strongly recommend players to buy is the Infinite Jade Card which sales for 666 Jades but gives the player 5 Jades every 5 hours forever. Maximum unclaimed Jades for this Card is 30, meaning the players should log in and claim Jades at least once every 30 hours. The next icon is the Missions Icon. There are two tabs on the right side of the Mission Menu. The top tab is daily missions and the bottom tab is achievements which cannot be repeated. Achievements are done as the players progress through the game and participate in different areas. For beginners, a notable achievement is the login achievements that gives 1 rare ticket per day for the first 10 login days. The Friends Icon is next to Missions. In the Friends menu, there are three tabs on the right side: Friends, Add, and Profile. In the Friends tab, you can chat with your friends with text message and voice messeges. The Profile section allows you to edit your profile. Next to Friends is the Onmyodo icon. This icon is for the players to inspect their unlocked Onmyojis (main characters). The bottom left corner is the switch button that allows the players to choose other onmyojis to take to battle. The left side tabs are “Info”, “Skill”, ”Guardian Beast”, and the “Background” of each Onmyoji. Detailed analysis of each Onmyoji can be found [here]. The last icon on the scroll is the Shikigami icon. This is where the players train their Shikigamis. Besides the Onmyojis, the Shikigamis are the main attacking units of the team. Therefore it is very important for the players to know how Shikigamis interact with each other. Once inside the menu, the left side are the list of Shikigamis the players own. When a Shikigami is selected, the player can train it by pressing the icon on the left side of the line that says: “cv ….”. The players can select other Shikigamis to feed to the one they selected. I recommend holding on the R Shikigamis for now as they may become stronger in future updates. Feeding Shikigamis deserve further discussion and analysis [here]. Under the name of the Shikigami (the vertical Chinese writing under SSR, SR, R, or N), there’s a small lock that lets the player lock/unlock the Shikigamis so they don’t accidently feed them. On the right side, the players can tap to open the detailed info page about the selected Shikigami. The info page shows detailed stats regarding the Shikigami. The players can also access Souls in the page. Souls are important as they directly influence the usefulness of the Shikigami. An SSR Shikigami would be a waste without good Souls to support it. The Soul system works similar to the Rune system in Summoner Wars. I will go into the Soul system in a bit more detail [here]. The players can also awaken the Shikigami to make it more powerful. In most cases, awakening should be done sooner than later once the players have the materials. There is no advantage holding back awakening to later except for a few Shikigamis such as Kamaitachi or Ebisu. There is an incentive to withhold awakening until their existing skills fully leveled before new skills are added by awakening. Now that we covered the bottom scroll, let’s check out some other features in the background. The Summon icon is actually the lantern hanging along the right side of the Court Yard. Once the players go in the summoning area, there are four options at the bottom for Summon: Normal Summon Tickets (Rarity N ~ R), Special Summon Tickets (Rarity R ~ SSR), Jade Summon for 100 Jade (Rarity R ~ SSR), and real life Summon (Rarity R~SSR). The bar on top show how much resource for each summoning option. Normal tickets are relatively easy to come by and can be summoned 10 at once. Of course, these are relatively weaker Shikigamis that are to be used at an early stage or as fodder. The Special tickets are harder to come by. They are either rewards from missions, achievements, or events, or are bought from shop. Special tickets are summoned one at a time and whenever the players summon, they have to draw a symbol on the screen. The symbols do not matter by the way so draw whatever. It’s all RNG. The Jade summons work the same way as special ticket summons but using Jade instead of tickets. The Jades are valuable resources in the game and I do not recommend you to use it for summon if you are FTP. There is a bundle in the shop for 11 special tickets and coins for 1000 Jades, around 10% discount. In the beginning, there should be 5 special summon tickets or so, which should give you a team you could work with. SSRs have a very low summoning rate in the game but they can come from other means. I don’t know an effective way to reroll if you are playing the PRC version, but if you are on the Taiwanese version, here’s a rerolling method for ios [here]. Disclaimer: I haven’t tried the methods before as I am not a fan of rerolling. To the left of the summon lantern at the main court yard, there should be an NPC (could be one of the characters the players have access to but not controlling) standing there with a dialogue circle showing “…”. When the players click that dialogue circle, the conversation begins and the players would progress with the story. Once the story begins, the players can always exit the story by clicking the arrow on the top left corner to come back to court yard. The story progress are automatically saved. 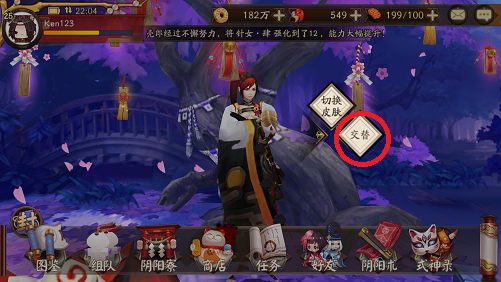 Unless the players understand Chinese and want to read the story line, the purple icons on the top right corner of the screen or dialogue box can be used to skip the story. Sometimes the NPC would not show a “…” circle for the story to proceed, this is because there are pre-requisites not met. Most often is the player level is too low. In that case, just go to exploration and level up. Some players may be interested to revisit the story. This can be done by clicking on the big tree in the background. In the very beginning, there should be one square show up and that one should be for changing court yard skins. Once the players started doing the main story, the Memories icon would appear right below the skin change icon. After selecting the chapter (by tapping the scroll), the players can then start reviewing previous stories by pressing the icon in the bottom center. As mentioned, click the big tree and the first icon is the skin change icon. Players can get Court Yard skins from participate in different events. Sometimes there would be holiday skins. Once the players unlock the background stories of other Shikigamis, they can choose to change the Shikigami in the Court Yard. The default Court Yard Shikigami is the two tailed fox. The players can click on the fox to choose other Shikigamis to display on the Court Yard. Click on other main character in the court yard background would bring up a menu for you to change the main character to bring to battle. All main characters level up at the same time as the players rank up, but the abilities level up individually. The players need to unlock/level up skills by doing achievements. The default main character is Abe no Seimei and as the story progresses, the players can unlock other characters. When you click on the main character, a menu would pop up. The top square is to change characters skin, which can be unlocked/purchased. The square icon below would switch this character to be the main character the players take to battle. Different main characters may have skills that benefits certain team composition. The exploration icon is shown in the Court Yard as a lantern. It is the lantern on the right said of the tree. This is where the action takes place. You can do explorations, challenge Shikigamis that you have discovered, get material and Souls, and do trials for rewards. Shikigami Shards: where the players can collect Shikigami Shards to access powerful Shikigamis. This is the source for SSR Shikigamis for many players. In the court yard, under the exploration lantern is the sign for Alley. Click on the sign will bring you to Alley screen. The players can go back to court yard by clicking the Court yard sign on the right. There maybe other players on the screen if you added enough friends and they are online. You can interact with them but it’s the 5 lanterns on top that is important. From left to right, they are Team PVP, Kirin Hunting/, Cleasing, PVP, and Demon Parade. In here you can invite either your fellow guild mate or your friends to team up and battle other teams. Click onto the red circle area to bring up the invitation menu. The drum in the bottom right corner starts the fight. This is another place where the players can get Jades and skin tickets. Hunting is initiated by the guild master daily. All guild members can participate to attack the bosses. Join an active guild to fight more often. Cleansing is where players fight Dharma Dolls for rewards. The Dharam Dolls levels up as the players rank up. Defeating them will yield rewards such as EN and materials. However, each player will only be allowed to fight once a day. Remember to collect rewards after the Cleansing is done. Note: Cleansing has been scrapped in the Mainland China server. I expect other servers would follow soon. The players are matched real time based on points accumulated. Players can battle with 3 Shikigamis each at the very beginning. Better rewards are available once the players reached higher tier. There are three tabs on the right side. The first tab is PVP tab. In here the players can see information regarding the current PVP event. Click on the drum on the bottom right corner to start the fight. The second tab is the ranking. The third tab is the tier. At tier one and two, players use 3 Shikigamis. At Tier Three and above, players use 5 Shikigamis. In Onmyoji, Demon Parade is an important source of getting Shikigamis shards. Each participation will cost one Demon Parade tickets. Clicking on the lantern will bring up the Demon Parade screen. On the left bottom of that screen there is a “+”circle to invite friends. Bringing a friend will increase the players’ bean accuracy and the friend have a chance to get rewards for free. On the right bottom, there is a button to start Demon Parade and it shows how many tickets you have available. As Demon Parade begin, the Shikigamis will walk across the screen. The players are to hit them with beans. The bean counter is on the bottom left. Each throw defaults at 5 beans but the players can increase to 10 beans each throw or decrease to 1 bean each throw by sliding the bar at the left bottom corner. The timer is in the upper center showing how much time is left. The player gets Shikigami Shards upon successfully hitting Shkigamis. Occasionally, there would be birds flying over for bonus buffs. Hit those birds will give the players extra bean, slow down Shikigamis, freeze them, etc. This concludes the basic controls of the Onmyoji game. I will keep updating this site as long as there is interest.